Psychostick's Josh Key talks about the humorcore band's new album, Bruce Campbell, and headgear mishaps before heading to Basement Transmissions Sunday, Nov. 9. It's not often that you'll hear people giggling at a metal concert, but it's not often that you come across a band quite like Psychostick. The humorcore band (yes, you read that genre name right) is just as capable of filling whatever venue it's in with gut-busting laughter as it is with riffs of rage, which is good, because laughter is a form of exercise. Psychostick's fans like the band so much that they helped fund it's latest album IV: Revenge of the Vengeance, which just came out today on Rock Ridge Music. Now the band is out on tour to support it's new release, including a date at Basement Transmissions for 6 p.m. Sunday, Nov. 9 with Downtown Brown, Fungonewrong, Bravura, and Geltin Skeleton. 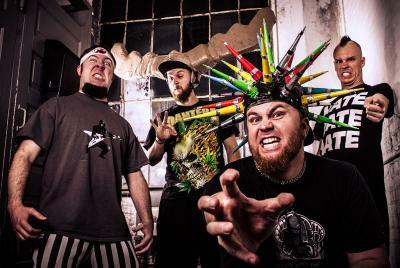 I had a chance to talk with Psychostick guitarist Josh Key about the band's new album, Bruce Campbell, and some interesting stage encounters that have happened in the group's 14-year existence. Alex Bieler: Your new album IV: Revenge of the Vengeance comes out shortly before your show in Erie. I saw that it was crowdfunded. Josh Key: That's true. Not just the album, but a recording studio as well. We did an Indiegogo campaign to help us build a recording studio so that we could record this album and future albums and anything else we want to do. We succeeded; we raised $37,000. AB: That's got to feel pretty good that you have fans that care that much about your future. JK: It's really flattering. Few bands even make it to the point of playing out of their home town or producing a CD and we have thousands of fans across the country who are willing to financially support what we do. It makes me feel really good. AB: The band was founded 14 years ago. Did have any expectations Psychostick to make it anywhere near that long? JK: Nope. [Laughs] Not at all. When we started the band, we had very realistic expectations, because it's just hard to get a band going. Most bands don't even make it out of their garage, let alone play a gig, let alone record a CD, let alone tour, let alone develop a national following. I feel very lucky that we have come this far. AB: When it comes to the title of the new album, why are you guys feeling so vengeful? JK: Well, we're pretty dang ridiculous. It's like a warning of "just so you know, we've got a new album, so you better watch out." AB: I see Bruce Campbell is a topic on one of the songs on the new album. Why Bruce? JK: This is true. [Laughs] First of all, he's awesome, but there's actually slightly more to that song than meets the eye. When we did the Indiegogo fundraiser campaign, one of the perks we offered was that we would write a song about whatever you want. One of our fans got that perk and he said "write a song about Bruce Campbell." The funny thing is, we thought about doing that for a long time, so we were like "well, I guess we're finally going to do it." We really have a million song ideas that we want to do, but we were like "okay guys, we can't screw this up; it's for Bruce." He's a legend, y'know – Evil Dead, Army of Darkness, Bubba Ho-Tep. I think we did a pretty good job of it. I hope he hears it and says "What's wrong with those guys?" AB: You mentioned about how you have a bunch of song ideas. How do you go about picking out what actually goes on the record? JK: It's really more about which song idea will bear the most fruit. There's a difference between having an idea for a song and being able to come up with enough content to come up with an actual song. You've got to evolve it, make a story out of it, or elaborate. It's really just whatever we're the most excited to do. If you start writing and you hit a wall, you move onto another one and come back to it later. AB: So do most of the ideas come from you guys joking around with each other? AB: [Laughs] It's like a challenge. JK: The best part is we were like "Should we make it a song out of that?" Challenge accepted. AB: As a bearded individual, I'm intrigued to see if there's anyone in the band -- and by that, I mean your drummer Alex -- who has beard envy? JK: He would never admit it, but I suspect so. I can neither confirm nor deny that. AB: I know that some people who just can't grow a beard will admit their envy, but so many just try to pretend that don't want or need one. JK: Yeah, "I can do this just fine without a beard," whatever fiction they create in their mind. AB: Then they go cry in the shower so that no one can see the tears. AB: Different topic, what is tour life like for you guys? JK: Oh man, that's a pretty broad question. Tour life is a ridiculous roller coaster where some days you feel like you are on top of the world and other days you want to strangle someone. It's definitely not boring. Unless you have a 12-hour drive, then it's actually pretty boring. If there is anything that could be an antonym for my life and what I do, "boring" would be it. I actually enjoy boredom now. If I actually have a moment where I'm legitimately bored, I'm like "This is nice, I don't have to do anything. I can just sit here and be bored!" AB: I remember in the song "Intervention For a Good Mood," the band talks about how you need a lot of hate because it's metal. You guys sound like you have a lot of fun, so how do you balance the hate and fun in your life? JK: Well, you just write funny songs about things that piss you off. That's one way to do it. I heard a saying from a comedian once that most people get up hoping that nothing goes wrong, but he hopes that something does go wrong so that he could have something to write about. Bad days turn into good music; that's the way I see it. AB: I was trolling through your Twitter account that you guys got a check from the NHL for about 60 cents for playing a song of yours in one of its stadiums. Is that true? JK: Yes. I believe they played "Obey the Beard" a few times. AB: Maybe it was a playoff beard thing. JK: Yeah, I think so. I saw the check and I heard the story, but I have never actually found the clip. Someone tried to send us a link of the clip, but we couldn't find the spot [where it was played], but word on the street was that it happened and we got a check for it, so I guess it did. AB: Was it really for 60 cents? JK: Um, probably. That's the way it works. If someone played our song on the radio, you might get a few quarters. It's pretty disappointing when you put it that way; thousands of people heard our song and we got 60 cents. That's just the way of the world, man. I didn't do this to be rich. Well, I was hoping to get rich, but that's not what keeps me going. [Laughs] It's being able to laugh at things like that that keeps me going. AB: It's the path of making dozen of dollars. JK: Mmhmm. I found out when I did my taxes last year, I almost made as much as a minimum-wage employee, I'll have you know. AB: That's got to feel nice. JK: [Laughs] I used to do web design, and I did a lot better financially doing web design. But you get paid in experiences – that's the way that I see it. AB: One thing I really want to ask about how each member of the band has preferred headgear. Have there been any mishaps because of said headgear? JK: Oh yeah. Um… can I curse? AB: Yeah, I'll be able to censor that. JK: Well, we were playing a show one time and this guy got on stage and was getting in the way. He went over to Rob and Rob has little spikes [on his hat], and he got poked in the eye. He just yells "Ah, you just poked me right in the f---ing eye!" It was like instant karma; just don't come onto the damn stage and bother the singer! AB: [Laughs] It's like a self-defense helmet, then. JK: Yeah it is. Although, I will say that I have personally seen our bassist arm-wrestle a dude who got on stage all while playing bass. This other guy we were touring with at the time joined in to try and throw to guy off because there wasn't any security that night, so I have seen our bassist – wearing antlers, by the way – playing defense, playing security, getting the man in a headlock, and playing the bass. He can multitask. AB: That is good. You guys are getting your money's worth out of him. Do you have any hopes or expectations for the show in Erie? JK: We haven't played in this venue [Basement Transmissions Theater], so I'm really curious to see that. Also, the show's not going to be in December. We played Erie once in January, and wow. It's the first time I've seen a dude have to drag a bike. He rode to the bar on his bike and the wheels wouldn't turn because they froze. That's the only time I've witnessed that. So, I'm hoping it's warmer than that. [Laughs] It's been a while since we've played [Erie], so I'm looking forward to get back there.